Not pictured: Bloody huge and expensive collected editions. So today I managed to make it to the comics shop, for a rather expensive visit. I only bought three actual comics, but the majority of the expense came from two omnibus editions that I’d been waiting on. More about those anon, but the three single-issue comics I picked up make for an interesting compare-and-contrast, so that’s what I’m going to do. Three writers, all British, of differing eras and evoking rather different responses. With Multiversity, Morrison continues his role as the mad genius of DC Comics. In this role, he’s been responsible for some fascinating comics (Batman Inc., Seven Soldiers of Victory), some messy disasters (Final Crisis), and at least one work of genius (All-Star Superman). Multiversity is very much more in the mode of Final Crisis—a massive crossover “event” title, but whereas for that Morrison was seen as an architect of DC strategy, with all the associated editorial fetters that brings, here he’s been given multiple alternative universes to play with, outside of DC’s mainstream output. The result is a title that’s fascinating to read but not exactly easy to understand. Multiversity is very much a comic about comics, addressing itself directly to the reader on the first page. It’s illustrated in classic heroic style by Ivan Reis, but as always with Morrison, there’s little assistance for the initiated. The tendency of characters to declaim rather than talk, the inspection of all the strange corners of superhero comics, the combination of playfulness with epic themes: there’s plenty of meat here for Morrison fans and superhero scholars, but if you’re not one or the other, or possibly both, you’re likely to be left cold. If Multerversity tends towards the opaque, Warren Ellis’s Supreme: Blue Rose #2 is wilfully obscure. Ellis is of the generation after Morrison, arriving in American comics with Marvel before proceeding to redefine the breadth of the superhero genre with The Authority and its depth with Planetary, then kicking it in the balls with the genuinely hilarious Nextwave. Ellis’s comics output has been sketchy in recent years for various reasons, not least of which is his own curiosity. He jumps from theme to theme and technique to technique in a manner that’s probably a little frustrating to his fans (such as myself), but the result is a body of work that’s probably the most diverse in mainstream comics today. With Supreme: Blue Rose, Ellis is doing an unusual thing for him and walking in already-trodden ground. The character of Supreme was created by Rob Liefeld as a modern Superman clone and reinvented by Alan Moore as a vehicle for investigating and celebrating the strangeness of Golden Age superhero comics. Ellis’s take on the character is hard to define as yet (two issues in and there’s no sign of anyone called Supreme) but he’s definitely found something in the idea that he thinks is worth mining, as the central character of Diana Dane begins to explore a universe seemingly gone awry and existing as one of many possible realities. So far, it’s hard to tell where Ellis is going with all of this. That’s not to say that the feeling of being confused is an unpleasant one. Ellis likes to experiment with the comics form, occasionally paring it back to the bare essentials, but on his game he’s as good a storyteller as anyone, and here he’s aided and abetted by the painterly beauty of Tula Lotay’s artwork, all sketchwork and pastel colours. Supreme: Blue Rose may eventually take its place among Ellis’s finest works, or it may falter and prove to be a flawed experiment. Either way, on current evidence, it’s fascinating and worth your time. 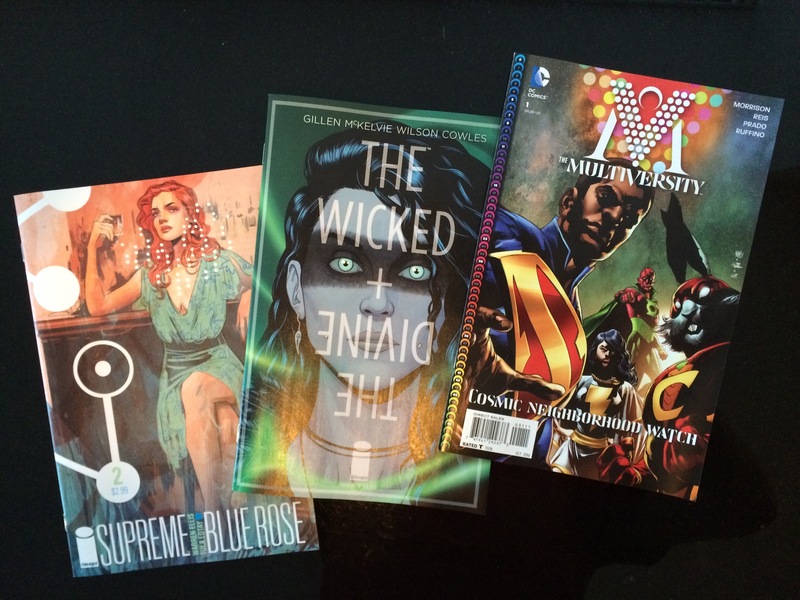 Rounding out the British trio is Kieron Gillen, with The Wicked + the Divine #3. Gillen is a recent arrival on the American comics scene, having enjoyed critical and fan acclaim for his runs on Journey into Mystery and Iron Man. Here he’s working again with his most notable artistic partner, Jamie McKelvie, with whom he’s already created Phonogram and Young Avengers. I’ve only recently started picking up his work, but he started by reading the same sort of comics as me**, and I’ve been reading his writing since his time as a writer for PC Gamer magazine. However, when the worst you can say about a comic is that it creaks a little in presenting its backstory, and the only actual misstep takes up no more than a single page, then you’re talking about something special. McKelvie’s art is clear and attractive, fitted perfectly to Gillen’s tale of modern-day gods of the music world, and this is just the first act of a series that’s aiming to be another long-form novel in graphic form, akin to Sandman and Transmetropolitan. Gillen’s fondness for twists in the narrative is already much in evidence, and for myself I wouldn’t be surprised if his reader-substitute, point-of-view character Laura is hiding a few dark secrets of her own. Whether you prefer single issues or collected editions, The Wicked + the Divine is something you might want to sample to see if it fits your frame of mind. Oh, and as for those omnibuses? Well, one of them was the second half of Gillen’s run on Journey into Mystery, wherein his mastery of building a twist narrative and his equal mastery of screwing with the emotions of his Tumblr followers first came into public view. 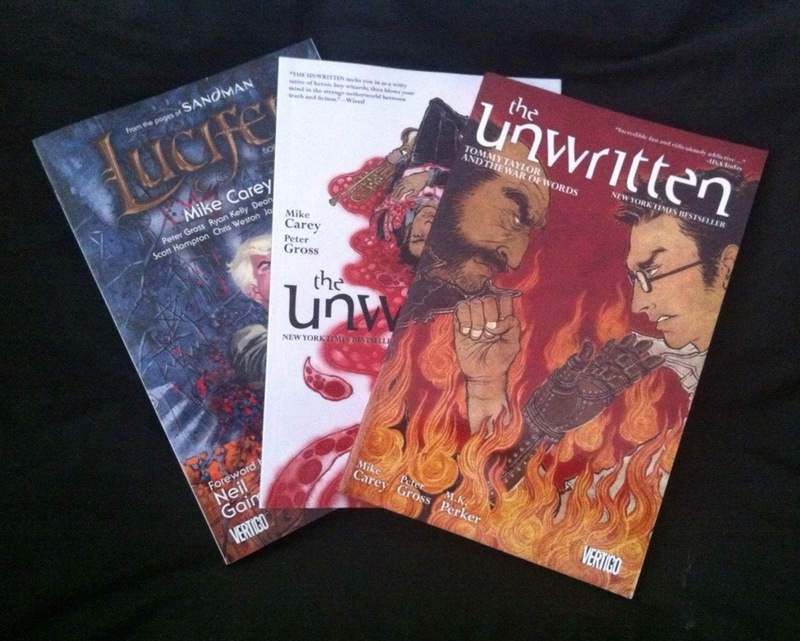 The other was the fourth and penultimate volume of Mike Carey’s Lucifer, the real successor to Neil Gaiman’s legendary Sandman. Carey is a writer who deserves a post all of his own, given my love of his work, and I hope to get around to writing that eventually. *One of Morrison’s best works, to my mind, is We3, in which he restrains his metatextual tendencies. **During his Iron Man run, Gillen managed to secure my everlasting affection by bringing back one of my favourite characters, Death’s Head, in a pitch-perfect cameo role. ***Ellis is an acknowledged influence on Gillen’s work. Gillen has also taken to heart Ellis’s engagement with his online audience, focusing in particular on Tumblr, where he regularly dissects the thinking behind his own work.